Sorry for the long weekend break yesterday, I just didn’t feel like working or blogging. So I took a personal day. But I’m back and with an outfit post no less! Today I’m highlighting the Lacey Shoulder Bag from Shop Suey Boutique. Mine is orange but currently they have the pink and light purple available on their site. This month when they asked me what I wanted to review I knew I wanted something with color because I rarely carry a black handbag unless it has some special detail on it. The Lacey is bigger than what I thought it was going to be but that makes me even happier. I tried to tell myself last month that I was going to go for smaller shoulder bags, but who am I kidding? I carry my life around with me and I successfully carried my iPad, makeup case, camera, 2 sets of glasses and my latest knitting project in this bag and still had room for more. Seriously. 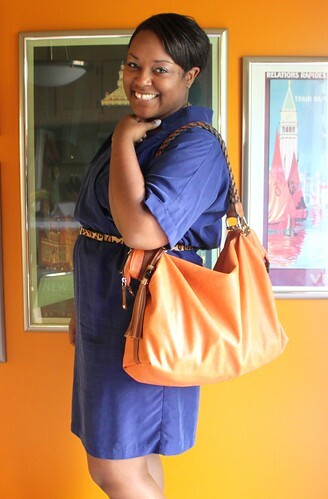 I’ve also been pairing this orange with pretty much any and everything in my wardrobe. I love wearing it with blue, such a great contrasting color. But it also works nicely against green and with orange and red too. 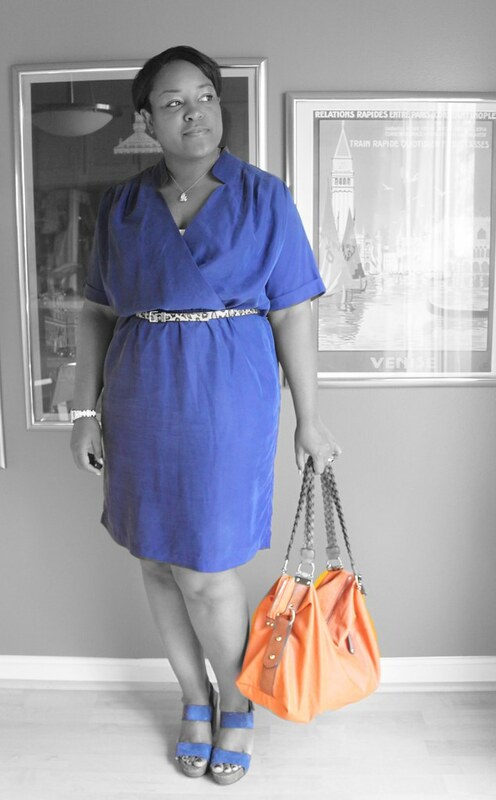 Color really can perk up any outfit and orange is definitely a color that can add a bit of fun to your wardrobe. Don’t forget, with the code ART20 you get 20% off of your full priced items at Shop Suey Boutique! Don’t forget to check out Shop Suey Boutique’s blog, on Facebook and on Twitter. Doesn’t orange make everything better? I love that color. Love the look & that bag is gorgeous! You look amazing as always! I love blue and orange together as a matter of fact those are the colors in my bathroom! I just stumbled across your blog this afternoon and I am so glad that I did. 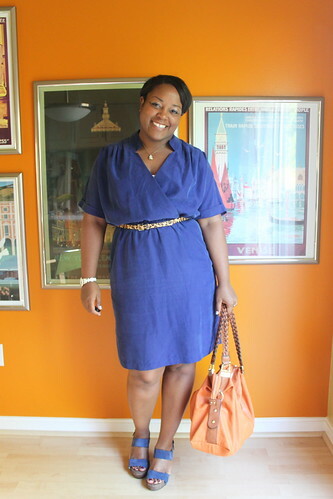 Love this outfit, especially the lovely blue color and your fun accessories. I love what a great, bright pop of color can do to a look. This is lovely! Well, Callie I’m so glad you stumbled across my site 🙂 welcome and I’ll definitely check out yours as well!